Ounce for ounce, liver is the most nutrient dense food in the world. It’s the ultimate preconception/prenatal food to help build up those nutrient stores and it’s an amazing fatigue fighter! It’s been considered a sacred food in many traditional cultures around the world for thousands of years. But, it can seem a little scary, especially if you don’t know what it’s going to taste like and you don’t know how to prepare it. Here’s a roundup of easy recipes for the liver beginner, plus methods for adding a little extra liver to food! It’s recommended to get one full serving, 3-8 oz a week, depending on how big you are and how many nutrients you need. If you’re TTC (trying to conceive), pregnant, or breastfeeding, you’ll want more like 8 oz a week. Make sure you get it from a good source: quality is imperative! No, the liver does NOT store toxins (that’s a common misconception), but it’s still important to get it from a source you trust where the animals were healthy. Grass-fed and organic is best. 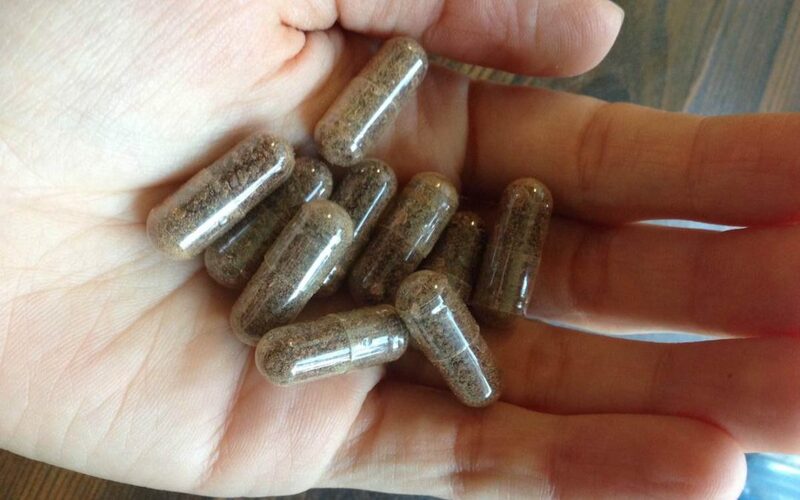 You can make liver pills by blending, dehydrating, blitzing and then encapsulating liver into empty gelatin capsules. While this way is time-consuming, it’s my favorite because it stays raw (retaining nutrients) and I don’t have to taste it at all. I make a big batch at once and it lasts me a few months! (Raw is fine as long as it’s been frozen at least two weeks to kill any potential pathogens.) You can also buy desiccated liver pills, but make sure you trust the source! Dr. Ron’s desiccated liver pills are a good option because they’re grass-fed and don’t have fillers. I take 8 pills a day to get to roughly four ounces a week. That seems like a lot, but think of it as getting a couple forkfuls of liver each day. Blend up liver, pour it into ice cube trays, and freeze it. Every time you use a pound of ground beef, add 1-2 cubes of the liver and mix it in. You and your family won’t taste it, won’t even know it’s there, and you will give your ground beef a boost of nutrients! I like the raw liver smoothie shot recipe that Liz Wolfe does. A little raw liver + 1/4 cup frozen fruits or juice concentrate blended and downed in one go. Like an energy drink with all the energy-giving B vitamins, but without the jitters! Because it’s sugary, I wouldn’t do that as a daily thing, just every once in a while when you feel like you need an extra boost to get through the day. Freeze raw liver and grate a small amount over your food before you eat it. You can also mix it into a raw egg yolk and feed it to baby for extra nutrients. Mix 10% liver into ground beef and make hamburger patties or best-ever meatballs. Ask your local butcher if he or she has a pre-mixed ground beef/organ meat on offer, because they sometimes do! If you are in the Pacific Northwest, Blue Valley Meats in Walla Walla has some (and they deliver all over WA), and Pat N Tam’s does a “Ground Beef Plus” that has heart plus liver mixed into ground beef. Anything you can make with ground meat, you can add ground organ meat into it for another boost. Think meatloaf, tacos, and so on! This is similar to the encapsulated liver pills, but a little less work. Freeze the liver for at least two weeks, then while frozen, cut into pea-sized chunks, place on parchment paper on a cookie tray, and put them back in the freezer. Take them like you would pills, storing them in a mason jar in the freezer. I took anywhere from 5-10, depending on the size. Don’t cut them too big, or they will be hard to swallow. You can take more or less depending on how much energy you need for the day! It’s basically liver plus butter and garlic and herbs. Chicken livers are more mild than beef liver, so they’re a good place to start if you’re just starting out with liver. And ANYTHING tastes awesome when it’s got a ton of butter mixed into it. I like this fun short video on how to make chicken liver pâté that another NTP and friend of mine made, and another chicken liver pâté recipe from another NTP friend, Lucia Hawley, who writes the blog Essential Omnivore. Try a good quality jerky that has some organ meats mixed in. We like Paleo Sticks when we’re on the go. It tastes like a pepperoni stick and you can hardly taste the organ meats. Marinate liver slices in lemon juice overnight. This step isn’t absolutely necessary, but it reduces the livery taste. Fry onions in butter in a frying pan, then pat the liver dry and fry it in the pan with more butter. It should still be a little pink in the middle. You can eat this as is, or if you want to cover up the taste a little more, drown it in organic sour cream, homemade mayonnaise, or ketchup (without high fructose corn syrup, and preferably without tons of sugar). Ketchup is culinary duct tape! I like this homemade ketchup recipe from Balanced Bites because it’s low sugar and tastes amazing! Aw! Thanks for the link love and nice top ten resource for those dubious of the livah! !